Ethnologue? (Language tree) and Wikipedia list six groups of Senufo: Karaboro, Kpalaga, Nafaanra, Senari, Suppire-Mamara, and Tagwana-Djimini. Of these, Senari and Suppire have the most speakers. This page deals only with the Senari group. Korhogo in Côte d'Ivoire is the major center for Cebaara. Nyarafolo is centered to the east around Ferkessedougou. 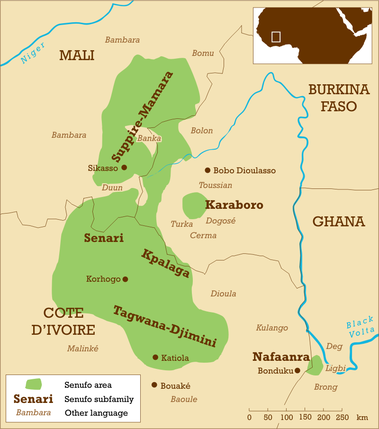 Syenara is spoken around Kadiolo, Mali, and Senara is spoken in Leraba Province, Burkina Faso (neither should be confused with "Senari," of which they are part). Senufo languages in Côte d'Ivoire use the official orthography developed for all languages in that country. (Webbook) This is Latin-based with extended characters and diacritics (not clear if the latter are required). Not aware of any localisation efforts. Localisation might logically focus first on Korhogo Cebaara. There is a question how to treat the dialects not part of either the Senari or the Suppire groups. Might it be possible to develop localisation strategies for the larger Senufo group including this and Suppire/Minianka? Hartell, Rhonda L. ed. 1993. The Alphabets of Africa/Alphabets de Langues Africaines. Dakar: UNESCO & SIL.